UPDATE January 27, 2014: In a new national ad, former Congresswoman Gabby Giffords again implies that since 90% of Americans support background checks that means that they will support the legislation that she is pushing. “What is Congress afraid of? 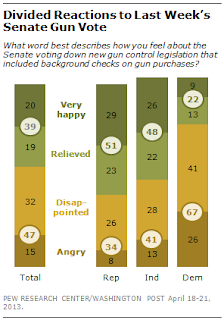 Nine out of 10 Americans support background checks. They make it harder for criminals and the mentally ill to get guns. At this Sunday’s town-hall style presidential debate the public is able to vote for their favorite questions. The ABC News and CNN moderators plan on using the 30 questions that receive the most votes. Largely because of efforts by gun control organizations, the current top two questions are both on gun control. Fox News has a news story on a new initiative being offered by California’s Lt. Gov. Gavin Newsom. The initiative has includes proposals either not approved by the the Democrat controlled legislature because they were viewed as unworkable or vetoed by the governor. “The question is who are you stopping from owning a firearm or getting hold of ammunition – in this case it is law-abiding, poor blacks and Hispanics who won’t be able to afford the cost of ammunition, which will rise with the cost associated with required background checks for ammunition purchases.” . Academic advocates of gun control apparently need to manipulate the data in order to argue for background checks on private gun transfers. Even the prestigious medical journal, the Lancet, does not seem to be above publishing junk science on gun control. Audience size 2+ million people. The Daily Ledger: President of Crime Prevention Research Center, Dr. John R. Lott Jr., discusses President Obama’s Executive Actions on Gun Control and how it will have a negative impact on law-abiding citizens. The full video can be viewed here.